There was something unmistakably different about one of the shoppers in the Wilmington Market Basket last month. Fully turned out in Victorian-era garb, the elderly woman seemed troubled. And she was unaccountably lingering near the frozen peas — until, abruptly, she wasn’t. “A ghost?” wondered Christiana Bush, the bakery employee at the store who spotted her, first to herself and then on a Facebook page. Has anyone else seen anything like it? 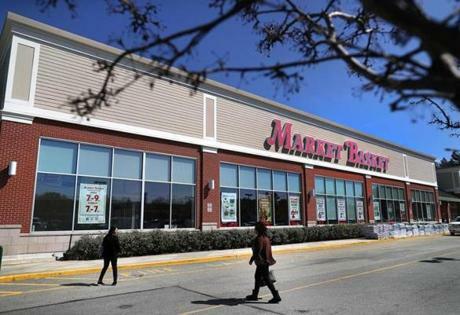 A ghost was reportedly seen near the frozen peas at this Wilmington Market Basket. No one could spot the ghost again — or guess who she might be. But might not this mystery be solved? Who, among all of Wilmington’s dead, might have a reason to haunt the spot? Fortunately, there are clues: Bush got a good look and recalls her vividly — wearing an old nightgown, her curly gray hair pinned up beneath a sleeping cap, her expression “a mixture of anger and melancholy,” she told the Globe. Market Basket employee Christiana Bush stood in the location where she saw an elderly woman in Victorian-era garb who suddenly vanished. Could it be a woman who had a strange connection to this place — a woman renowned for her fascination with the afterlife? In the late 1800s, Wilmington was home to an eccentric figure known as much for her lavish lifestyle as for her obsession with immortality — a larger-than-life character who was determined, as the end of life approached, to be larger-than-death as well, to literally transcend the grave. Boston Globe headlines after the death of France Hiller in 1900. 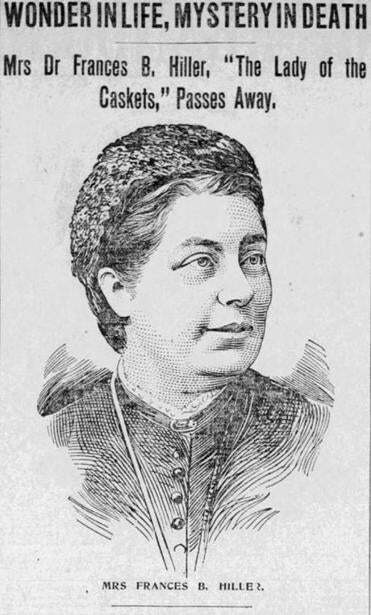 Hiller, who was born in Gloucester, England, is said to have moved with her husband, Dr. Henry Hiller, to Wilmington in 1873. They had a large house on Main Street, a short stroll from where Market Basket stands today, according to a 19th-century Wilmington map. They owned 16 acres of property, which would come to include a successful cranberry bog and processing operation. 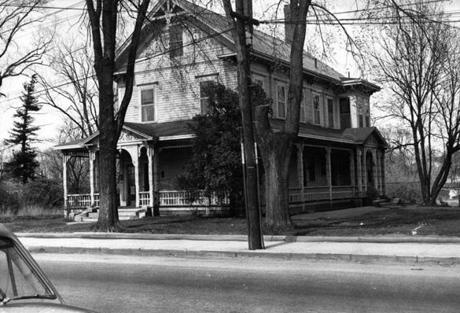 The onetime house of France and Henry Hiller on Main Street in Wilmington, circa 1955. 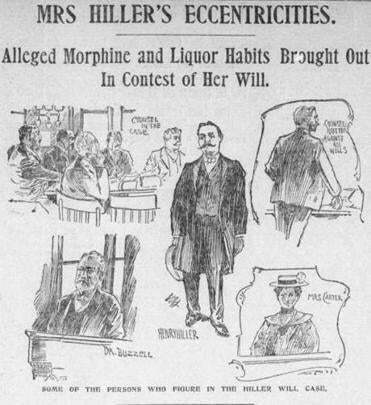 Both self-described doctors, the Hillers were swimming in wealth acquired from Henry’s patent-medicine pills, which discreetly promised to cure “Errors of Youth” (possibly syphilis), remedy “Lost Manhood,” and bring “renewed life and vigor.” Sold through the New England Medical Institute, his business in Boston’s Scollay Square, they purportedly contained coca, the basis for cocaine. France Hiller said they were worth millions. “Everything we touched turned to gold in our hands,” she told the Globe of her day, which covered her doings copiously and with breathless enthusiasm. 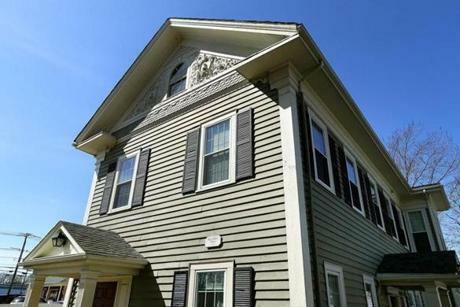 At night, the couple liked to amble down Main Street, according to a history of the couple written by Ann Berghaus, a former member of the town’s historical commission — probably passing right by the future Market Basket site. Dreading the idea of decaying underground, the couple agreed that “they must be placed in caskets above the ground,” Berghaus explained. So began their “Scheme to Conquer Death,” according to a 19th-century Globe headline. The Hillers hired a woodcarver to create four magnificent caskets for the couple: two structures each, with coffins nesting inside monumental sarcophagi weighing 2,000 pounds. Henry Hiller died unexpectedly in 1888, when only his inner casket was finished. His remains were placed in a special tomb built above ground, in a mound created at Wilmington’s Wildwood Cemetery. A regal catafalque transported the body as 2,000 people flocked to the funeral — “all of Eastern Massachusetts,” declared the Globe. Work proceeded on Mrs. Hiller’s grand vision, and a year later, she mounted a lavish exhibition in Boston of her funerary plans, revealing the caskets and a design for a great mausoleum. Hiller treasured the caskets so much that she liked to lie inside hers, dressed in her funeral gown and decked in jewels, gazing at herself in a mirror suspended from the ceiling. Hiller courted publicity and was a magnet for the newspapers of the era. “No ghost that ever walked or stalked by midnight was an object of so much awe and wonder-making curiosity,” wrote the Globe in 1889. No ghost, did you say? The coverage of her doings was not always — how to say? — fact-driven. Hiller, by various accounts, was an heiress from South America and fluent in ancient Greek and Latin. She said that she knew all the biggest English literary celebrities, and that Queen Victoria herself complimented her on her husband’s funeral. In 1892 she even apparently sent a letter to the Globe announcing her own death, as a hoax. Amid the ensuing scramble, someone recognized the handwriting on the obituary listing request. As part of the arrangement, Surrette agreed, bizarrely, to change his name to that of her late husband, Henry Hiller. She set Henry Hiller II up with a fruit and general store — and after that closed, a cigar, confectionery, and soda shop. 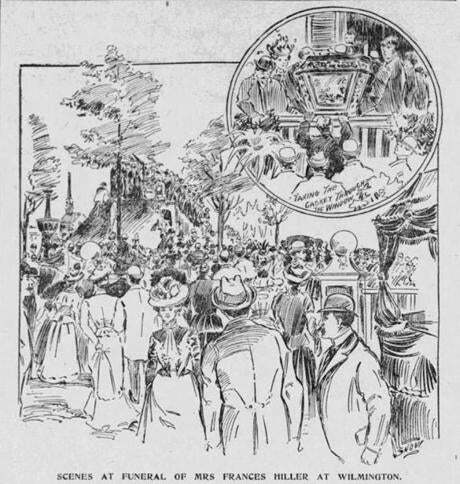 This illustration of France Hiller's funeral ran in The Boston Globe on May 24, 1900. In May 1900, the woman who had thought so long of death passed away. There was dispute about her age, but a niece said she was 62. The day of her funeral was “practically a holiday in the village,” according to a Globe account. She was interred with Dr. Henry Hiller at Wildwood Cemetery. Their burial mound was roughly 10 feet from the road, right within the gate. This image depicts key figures in the court wrangling over France Hiller's will. Among them is Henry Hiller II, her coachman whom she married, with the agreement that he would take the same name as her late husband, Dr. Henry Hiller. This was on the front page of The Boston Globe in September 1900. While her body rested according to her plans, legal wrangling over her will revealed much she’d kept secret: She’d spent her final days as a morphine addict and alcoholic, prone to dark moods and even violence, according to witnesses. Court battles also revealed that despite all her big talk, she left behind just $12,240 in personal property and real estate worth an estimated $31,820. Eventually her tomb fell into disrepair and started to leak. 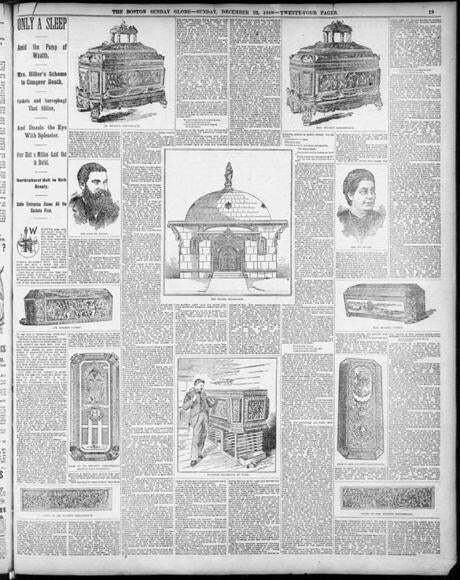 With permission from her widower, the above-ground tomb was removed in 1935, the hill razed, “and a new tomb was built below ground-level for the precious caskets,” according to the Globe. So “the Lady of the Caskets” was buried underground, after all — the thing she most abhorred. 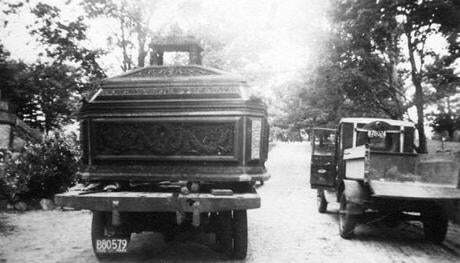 The elaborate caskets of France and Henry Hiller were transferred and buried in Wilmington’s Wildwood Cemetery in 1935. The Hiller house, and the grave markers for Dr. Henry Hiller and Dr. France B. Hiller, still stand, though the house has since been moved. Henry Hiller II went on to work as a crossing tender for the railroad and then for the town, and he died in 1958. Those who know France Hiller’s legend well said it never crossed their minds that reports of a ghost at Market Basket could have anything to do with her. The current site of the onetime Hiller House, which was originally located on Main Street. Larz F. Neilson, the former editor of the Town Crier, who has since retired from the local paper and moved to Maine, also batted away the idea. “I have not ever heard of anything allegedly happening with any spirit connected to her,” he said. 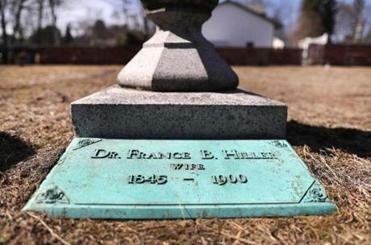 France Hiller’s grave marker at Wildwood Cemetery. The same can’t be said for Bush, the Market Basket worker who set off all the curiosity about the ghost. When shown a portrait of France Hiller that appeared in the Globe more than 100 years ago, she said she noticed some eerie similarities with the woman she saw. Could the ghost of France Hiller be lingering in Wilmington, displeased with her reburial below ground? Unhappy that her widower allowed this to be, where might she have gone looking for him? Why not the nearest market — his livelihood when she last knew him?